There are many ways you can go to Cambodia from Vietnam, Thailand, Laos, Singapore, China or Hong Kong, including air and road. If you are in Ho Chi Minh City to Cambodia by road is the most economical and enjoyable. 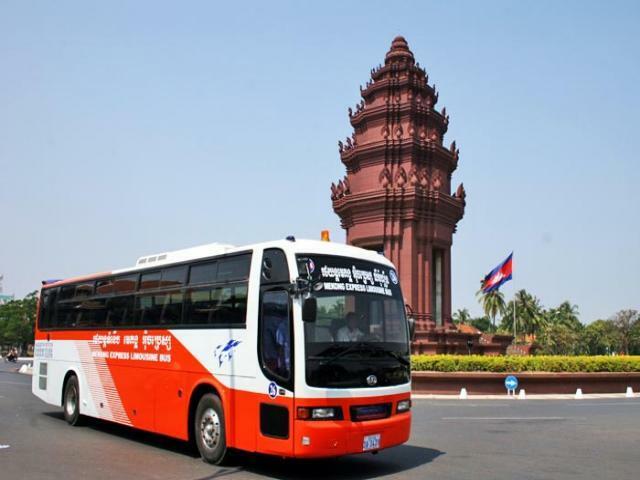 It only takes 6 hours to take a bus to many points in Phnom Penh Cambodia as, Siem Reap and Sihanoukville with only 20usd fare. If you fly, total flight time from Tan Son Nhat airport to Siem Reap is an hour and 1h40m from Hanoi with the average ticket price is 200usd. 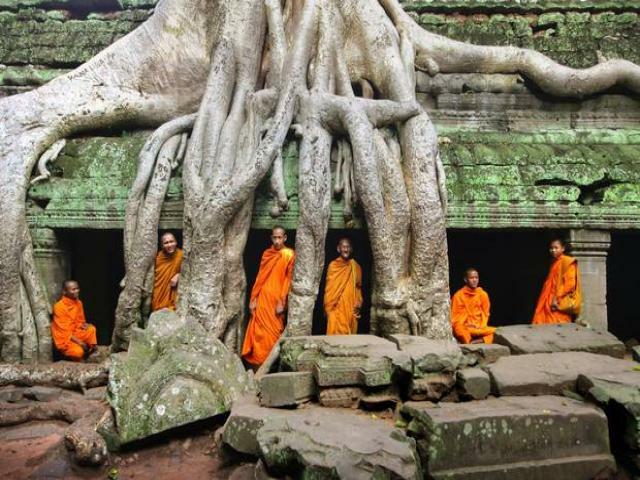 Angkor Wat is a destination not to be missed while in Cambodia. 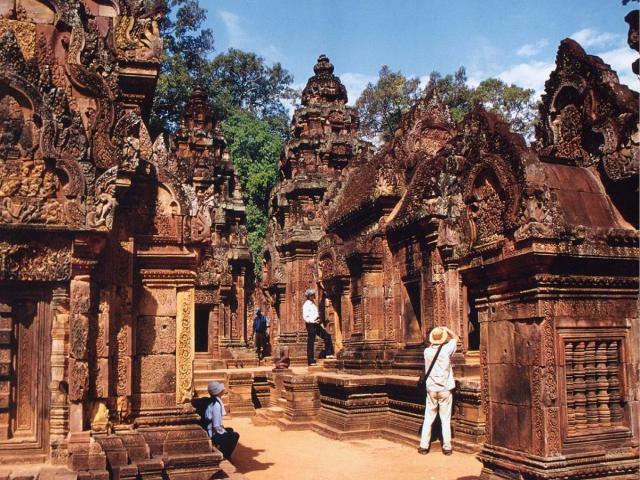 This is a historic dynasty of the late Khmer from the 9th century to the 15th century, it is surrounded by a dense forest. Angkor Wat has unique architectural and cultural resources of ancient Khmer. If you have arrived here, you do not miss to watch the sunset from the temple of Angkor Wat. You can rent a bike, or ride the tuk tuk for about 15usd per day. Apart from the capital, Phnom Penh, you can go to the neighboring city. Bumpy and difficult road, but the price is very cheap. Moreover, you will have the exciting experience when having sightseeing along the way. There are many buses and have many exciting destinations for you to stop and explore all day. 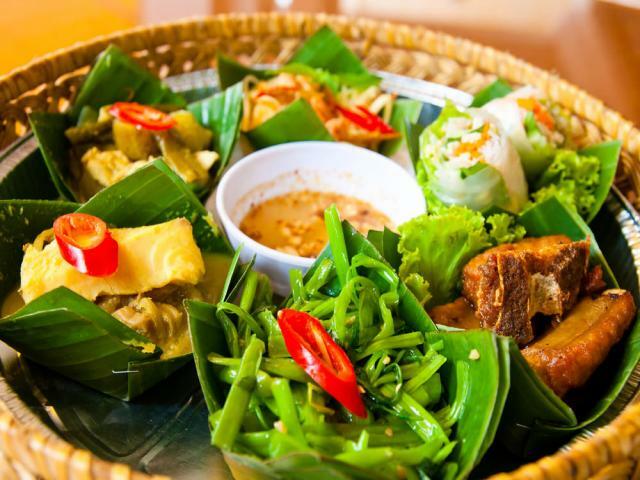 Cambodian street food is delicious, varied and fascinating. Regardless of who to Cambodia would all love the fried rice and fried noodle dish of this country. In addition, you also experience strange eating local dishes as thui hamsters, spiders, snakes and crickets grilled. 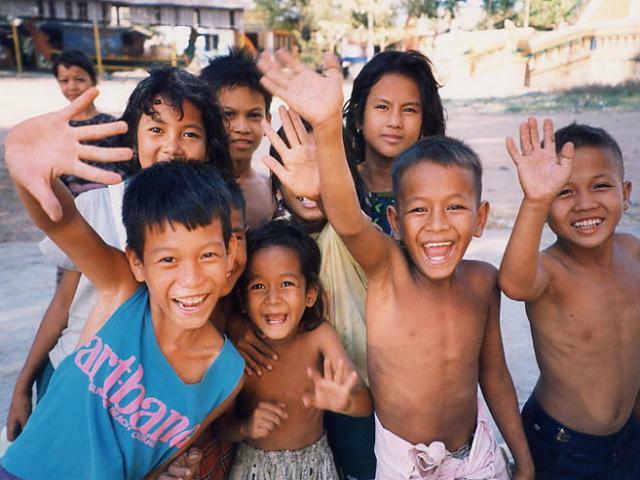 Cambodian people are very friendly and open to foreign tourists. They are always affable, talking, smiling and ready to take a photo with you if you want. 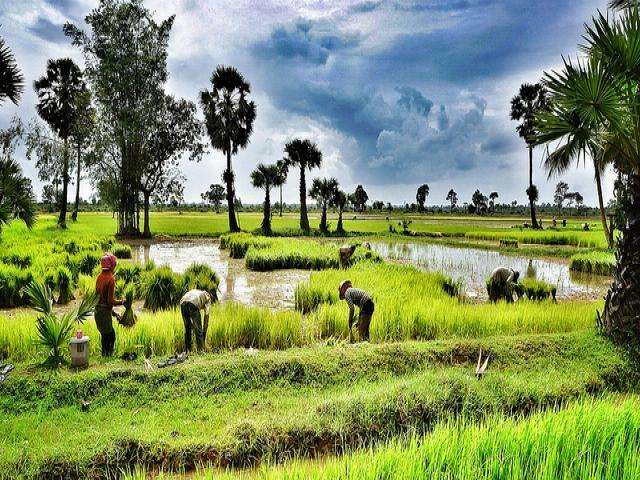 75% of Cambodians are still engaged in agriculture. 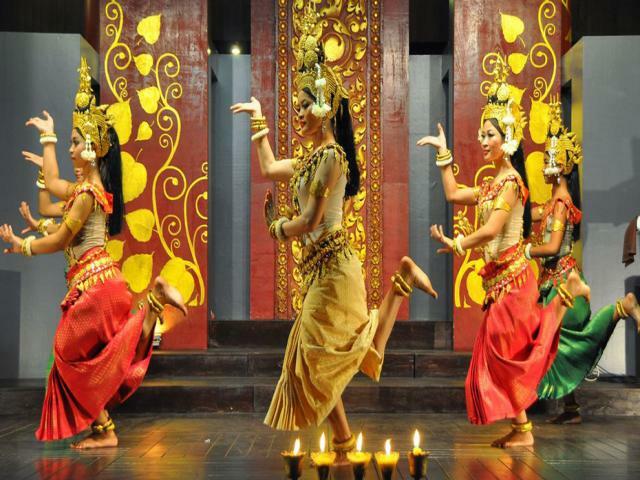 Cultural and scenic beauty of Cambodia remained untouched argriculture. When you come here, you will experience in the open space of water, and the immense space of the rice fields. Whether you are female and traveling alone, Cambodia has always been the safe place and peaceful. You will not have to worry about the problem of fraud or thefts. If you're looking for a retreat with the quiet beaches, untouched instead of big and crowded resorts, you should choose Cambodia. From the capital, Phnom Penh, you can go to Kep and Rabbit Island boating child. This small island of only a few tents and electricity lit only 4 hours / day. If you want to go to a bigger place, go to Sihanoukville or speed boat to the island of Koh Rong. This island is very quiet, with white sand and blue water. When you come here, you will feel totally relaxed as if you were in paradise really. 10. Chi phí du lịch rẻ. Nếu bạn đang cân nhắc đi du lịch ở đâu vừa đẹp và vừa rẻ, bạn nên chọn Campuchia. Bạn không cần phải tiết kiệm chi tiêu cả năm mà vẫn có thể đi du lịch nước ngoài. Trung bình, bạn chỉ phải bỏ ra khoảng 200.000-300.000 đồng để thuê một phòng đơn và nếu bạn ở kiểu phòng dorm - ký túc xá, chi phí còn rẻ hơn, khoảng 60.000-100.000 đồng một giường. Giá các món ẩm thực đường phố cũng rất mềm, khoảng 20.000-60.000 đồng một bữa. Bạn cũng chỉ cần chuẩn bị một ít tiền lẻ để đi lại bằng xe bus, rất tiện lợi. 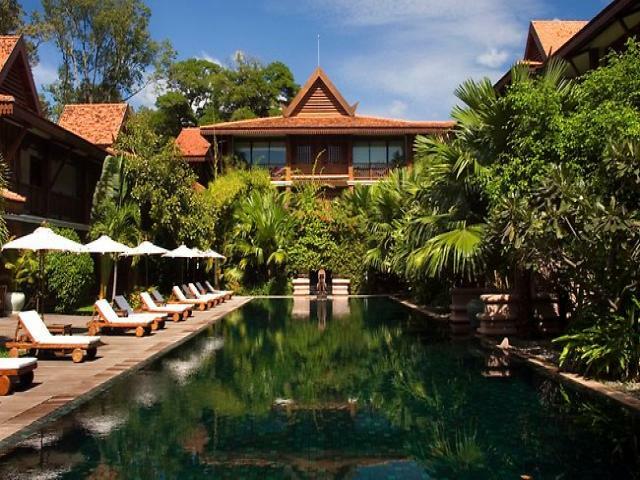 If you are considering traveling to where are both beautiful and cheaper, you should choose Cambodia. You do not have to save to spend the whole year and still be able to travel abroad. On average, you only have to spend about 20 to 30usd to rent a single room. Price on street food is also very soft, about 5-10usd per meal. You just need to prepare some changes to travel by bus, so convenient.